The Gutenberg Bible is named after its creator, Johannes Gutenberg. Johannes Gutenberg was born in Mainz, Germany on June 24, 1398. He was born into a trade smith family and aspired to be a goldsmith when he was a child. Nothing else is known about Gutenberg’s childhood and upbringing. In December of 1452, Gutenberg went into heavy debt after attempting to open a printing shop. He borrowed money from Johann Fust. For the rest of his life, Gutenberg struggled with the debt. There is also very little known about the months leading up to Gutenberg’s death. However, it is believed that in the months leading up to his death, Gutenberg went blind. Gutenberg died at the age of 70 on February 3, 1468. The Gutenberg Bible, an edition of the Vulgate, contains the Latin version of both the Hebrew Old Testament and the Greek New Testament. It is mainly the work of Jerome who began his work on the translation in 380 AD, with emendations from the Parisian Bible tradition, and further divergences (the Paris Bible, one of many Bible translations in the Middle Ages, is also known as the "Thirteenth-Century Bible", "Old French Bible" or, in French, "Bible du XIIIe siècle"). Gutenberg Bible at the Beinecke Rare Book & Manuscript Library. The Bible was not Gutenberg's first work. Preparation of the Bible probably began soon after 1450, and the first finished copies were available in 1454 or 1455. It is not known exactly how long the Bible took to print. The first precisely datable printing is the Gutenberg's 31-line Indulgence which is known to already exist on 22 October 1454. Gutenberg made three significant changes during the printing process. The first sheets were rubricated by being passed twice through the printing press, using black and then red ink. This was soon abandoned, with spaces being left for rubrication to be added by hand. Some time later, after more sheets had been printed, the number of lines per page was increased from 40 to 42, presumably to save paper. Therefore, pages 1 to 9 and pages 256 to 265, presumably the first ones printed, have 40 lines each. Page 10 has 41, and from there on the 42 lines appear. The increase in line number was achieved by decreasing the interline spacing, rather than increasing the printed area of the page. Finally, the print run was increased, necessitating resetting those pages which had already been printed. The new sheets were all reset to 42 lines per page. Consequently, there are two distinct settings in folios 1-32 and 129-158 of volume I and folios 1-16 and 162 of volume II. The most reliable information about the Bible's date comes from a letter. 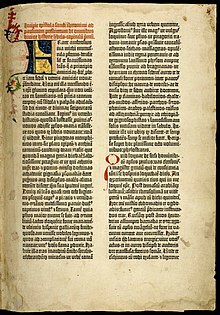 In March 1455, the future Pope Pius II wrote that he had seen pages from the Gutenberg Bible, being displayed to promote the edition, in Frankfurt. It is not known how many copies were printed, with the 1455 letter citing sources for both 158 and 180 copies. Scholars today think that examination of surviving copies suggests that somewhere between 160 and 185 copies were printed, with about three-quarters on paper and the others on vellum. However, some books say that about 180 copies were printed and it took about three years to produce them. In a legal paper, written after completion of the Bible, Johannes Gutenberg refers to the process as Das Werk der Bücher (“the work of the books”). He had copied the technology of the printing press and was the first European to print with movable type, but his greatest achievement was arguably demonstrating that the process of printing actually produced books. Many book-lovers have commented on the high standards achieved in the production of the Gutenberg Bible, some describing it as one of the most beautiful books ever printed. The quality of both the ink and other materials and the printing itself have been noted. The paper size is 'double folio', with two pages printed on each side (four pages per sheet). After printing the paper was folded once to the size of a single page. Typically, five of these folded sheets (10 leaves, or 20 printed pages) were combined to a single physical section, called a quinternion, that could then be bound into a book. Some sections, however, had as few as four leaves or as many as 12 leaves. Some sections may have been printed in a larger number, especially those printed later in the publishing process, and sold unbound. The pages were not numbered. The technique was not new, since it had been used to make blank "white-paper" books to be written afterwards. What was new was determining beforehand the correct placement and orientation of each page on the five sheets to result in the correct sequence when bound. The technique for locating the printed area correctly on each page was also new. The 42-line Bible was printed on the size of paper known as 'Royal'. A full sheet of Royal paper measures 42 x 60 centimetres and a single untrimmed folio leaf measures 42 x 30 cm. There have been attempts to claim that the book was printed on larger paper measuring 30.7 x 44.5 cm, but this assertion is contradicted by the dimensions of existing copies. For example, the leaves of the copy in the Bodleian Library, Oxford, measure 40 × 28.6 cm. This is typical of other folio Bibles printed on Royal paper in the fifteenth century. Most fifteenth-century printing papers have a width-to-height ratio of 1:1.4 (e.g. 30:42 cm) which is mathematically a ratio of 1 to the square root of 2. Man suggests that this ratio was chosen to match the so-called Golden Ratio of 1:1.6; in fact the ratios are not at all similar (a difference of about 12%). The ratio of 1:1.4 was a long established one for medieval paper sizes. A single complete copy of the Gutenberg Bible has 1,286 pages (usually bound in two volumes); with four pages per folio-sheet, 322 sheets of paper are required per copy. The handmade paper used by Gutenberg was of fine quality and was imported from Italy. Each sheet contains a watermark left by the paper mold. In Gutenberg's time, inks used by scribes to produce manuscripts were water-based. Gutenberg developed an oil-based ink that would better adhere to his metal type. His ink was primarily carbon, but also had a high metallic content, with copper, lead, and titanium predominating. Head of collections at the British Library, Dr Kristian Jensen, described it thus: "if you look (at the pages of The Gutenberg Bible) closely you will see this is a very shiny surface. When you write you use a water based ink, you put your pen into it and it runs off. Now if you print that's exactly what you don't want. One of Gutenberg's inventions was an ink which wasn't ink, it's a varnish. So what we call printer's ink is actually a varnish, and that means it sticks to its surface." The first part of the Gutenberg idea was using a single, hand-carved character to create identical copies of itself. Cutting a single letter could take a craftsman a day of work. A single page taking 2500 letters made this way was impractical. A less labour-intensive method of reproduction was needed. Copies were produced by stamping the original into an iron plate, called a matrix. A rectangular tube was then connected to the matrix, creating a container in which molten type metal could be poured. Once cooled, the solid metal form was released from the tube. The fundamental innovation is that this matrix can be used to produce many duplicates of the same letter. The result of each molding was a rectangular block of metal with the form of the desired character protruding from the end. This piece of type could be put in a line, facing up, with other pieces of type. These lines were arranged to form blocks of text, which could be inked and pressed against paper, transferring the desired text to the paper. Each unique character requires a master piece of type in order to be replicated. Given that each letter has uppercase and lowercase forms, and the number of various punctuation marks and ligatures (e.g. the character 'ﬁ', commonly used in writing) the Gutenberg Bible needed a set of 290 master characters. It seems probable that six pages, containing 15600 characters altogether, would be set at any one moment. 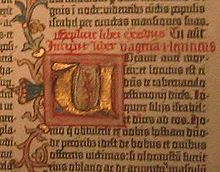 The Gutenberg Bible is printed in the blackletter type styles that would become known as Textualis (Textura) and Schwabacher. The name texture refers to the texture of the printed page: straight vertical strokes combined with horizontal lines, giving the impression of a woven structure. Gutenberg already used the technique of justification, that is, creating a vertical, not indented, alignment at the left and right-hand sides of the column. To do this, he used various methods, including using characters of narrower widths, adding extra spaces around punctuation, and varying the widths of spaces around words. He also let the punctuation marks go beyond the vertical line using hanging punctuation, which was used to make the justification of the massive black characters stronger to the eye. Detail showing both rubrication and illumination. Initially the rubrics — the headings before each book of the Bible — were printed, but this practice was quickly abandoned, and gaps were left for rubrication to be added by hand. A guide of the text to be added to each page, printed for use by rubricators, survives. The spacious margin allowed illuminated decoration to be added by hand. The amount of decoration presumably depended on how much each buyer could or would pay. Some copies were never decorated. The place of decoration can be known or inferred for about 30 of the surviving copies. It is possible that 13 of these copies received their decoration in Mainz, but others were worked on as far away as London. The vellum Bibles were more expensive, and perhaps for this reason tend to be more highly decorated, although the vellum copy in the British Library is completely undecorated. There has been speculation that the "Master of the Playing Cards," an unidentified engraver who has been called "the first personality in the history of engraving," was partly responsible for the illumination of the copy held by the Princeton University library. However, all that can be said for certain is that the same model book was used for some of the illustrations in this copy and for some of the Master's illustrated playing cards. Although many Gutenberg Bibles have been rebound over the years, nine copies retain fifteenth-century bindings. Most of these copies were bound in either Mainz or Erfurt. Most copies were divided into two volumes, the first volume ending with The Book of Psalms. Copies on vellum were heavier and for this reason were sometimes bound in three or four volumes. The Bible seems to have sold out immediately, with initial sales to owners as far away as England and possibly Sweden and Hungary. At least some copies are known to have sold for 30 florins – about three years' wages for a clerk. Although this made them significantly cheaper than manuscript Bibles, most students, priests or other people of ordinary income wouldn't have been able to afford them. It is assumed that most were sold to monasteries, universities and particularly wealthy individuals. At present only one copy is known to have been privately owned in the fifteenth century. Some are known to have been used for communal readings in monastery refectories; others may have been for display rather than use, and a few were certainly used for study. Kristian Jensen suggests that many copies were bought by wealthy and pious laypeople for donation to religious institutions. The Gutenberg Bible had a profound effect on the history of the printed book. Textually, it also had an influence on future editions of the Bible. It provided the model for several later editions, including the 36 Line Bible, Mentelin's Latin Bible, and the first and third Eggestein Bibles. The third Eggestein Bible was set from the copy of the Gutenberg Bible now in Cambridge University Library. 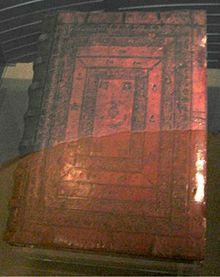 The Gutenberg Bible also had an influence on the Clementine edition of the Vulgate commissioned by the Papacy in the late sixteenth century. Joseph Martini, a New York book dealer, found that the Gutenberg Bible held by the library of the General Theological Seminary in New York had a forged leaf, carrying part of Chapter 14, all of Chapter 15, and part of Chapter 16 of the Book of Ezekiel. It was impossible to tell when the leaf had been inserted into the volume. It was replaced in the fall of 1953, when a patron donated the corresponding leaf from a defective Gutenberg second volume which was being broken up and sold in parts. This made it "the first imperfect Gutenberg Bible ever restored to completeness." In 1978, this copy was sold for $2.2 million USD to the Württembergische Landesbibliothek in Stuttgart, Germany. Locations of known complete Gutenberg Bibles. As of 2009, 49 Gutenberg Bibles are known to exist, but of these only 21 are complete. Others have pages or even whole volumes missing. In addition, there are a substantial number of fragments, some as small as individual leaves, which are likely to represent about another 16 copies. Many of these fragments have survived because they were used as part of the binding of later books. There are 12 surviving copies on vellum, although only four of these are complete and one is of the New Testament only. Copy numbers listed below are as found in the Incunabula Short Title Catalogue, taken from a 1985 survey of existing copies by Ilona Hubay; the two copies in Russia were not known to exist in 1985, and therefore were not catalogued. Austria (1) Austrian National Library, Vienna 27 complete paper One of only two copies to contain the "tabula rubricarum" (index of rubrics) on four leaves at the end. Obtained from Friedrich Karl Joseph von Erthal in 1793. Belgium (1) Library of the University of Mons-Hainaut, Mons 1 incomplete paper Vol. I, 104 leaves missing, bequeathed by Edmond Puissant [nl] to the city of Mons in 1934, but not identified until 1950. Part of the same copy as the volume in Indiana (see below). Denmark (1) Danish Royal Library, Copenhagen 13 incomplete paper Vol. II, first leaf missing. Acquired in 1749. France (4) Bibliothèque nationale de France, Paris 15 complete vellum Sold to the library in 1788 by Cardinal Étienne Charles de Loménie de Brienne, and rebound in four volumes. 17 incomplete paper Is distinguished by being inscribed with the earliest date that appears on any copy — 24 August 1456 on the first volume and 15 August 1456 on the second volume, the dates on which the rubricator and binder (Henricus Cremer) completed his work. Bibliothèque Mazarine, Paris 16 complete paper The first copy to be discovered around 1760 in the Bibliothèque Mazarine, hence the name Mazarin Bible, by Guillaume-François Debure and described in the first volume of his Bibliographie instructive: ou Traite de la connoissance des livres rares et singuliers devoted to theology, which was published in Paris in 1763. Bibliothèque Municipale, Saint-Omer 18 incomplete paper Vol. I, one missing leaf. Acquired from the Abbey of Saint Bertin. Germany (13) Gutenberg Museum, Mainz 8 incomplete paper The Shuckburgh copy, two volumes but imperfect, sold by Hans P. Kraus for $1.8 million in March 1978. 9 incomplete paper Vol. II, the Solms-Laubach copy acquired in 1925. Hochschul- und Landesbibliothek Fulda [de], Fulda 4 incomplete vellum Vol. I. Two individual leaves from Vol. II survive in other libraries. Leipzig University Library, Leipzig 14 incomplete vellum Vol. I through IV. Bavarian State Library, Munich 5 complete paper One of only two copies to contain the "tabula rubricarum" (index of rubrics) on four leaves at the end. Württembergische Landesbibliothek, Stuttgart 10 incomplete paper Purchased in April 1978 for 2.2 million US dollars from the General Theological Seminary. Japan (1) Keio University Library, Tokyo 45 incomplete paper Originally part of the Estelle Doheny bequest to St. John's Seminary in Camarillo, California. Vol. I, sold in October 1987 to Maruzen booksellers for $4.9 million (plus an auction house commission of $490,000) for a total of 5.4 million US dollars. Purchased by Keio University in 1996. Poland (1) Diocesan Museum in Pelplin 28 incomplete paper The only existing copy in two volumes surviving in its original 15th-century binding. See: digitized sample page images from both volumes including print (vol.1) and binding (vol.2). It has a blot on page 46 and it lacks a page 217 in Volume Two. Portugal (1) Biblioteca Nacional de Portugal, Lisbon 29 complete paper Formerly owned by Cardinal Étienne Charles de Loménie de Brienne. Russia (2) Moscow State University, Moscow 49 complete paper Looted in 1945 from the library of the University of Leipzig. Russian State Library, Moscow 48 incomplete vellum Acquired in 1886 by the German Museum of Books and Writing, Leipzig, as part of the book collection of Heinrich Klemm [de]. At the end of World War II, it was taken as war booty and transferred to the Russian State Library in Moscow, where it remains today. United Kingdom (8) British Library, London 19 complete vellum The Grenville copy. Bought for 6260 francs in 1817 by Thomas Grenville, who bequeathed his collection to the British Museum in 1846. John Rylands Library, Manchester 25 complete paper Acquired for £80 by George Spencer, 2nd Earl Spencer some time before 1814, Enriqueta Augustina Rylands bought it in 1892 for the John Rylands Library. Bodleian Library, Oxford 24 complete paper Bought in 1793 for £100 from Cardinal Étienne Charles de Loménie de Brienne. Cambridge University Library, Cambridge 22 complete paper Acquired as part of a gift in 1933. United States (11) The Morgan Library & Museum, New York 37 incomplete vellum PML 13 & PML 818. Acquired in 1815 by Mark Masterman-Sykes. Library of Congress, Washington, D.C. 35 complete vellum Online images Printed on vellum and bound in three vellum covered volumes. On permanent display. Purchased in 1930 with government funds for the Library of Congress. It is the center piece of a larger book collection acquired from Dr. Otto Vollbehr. Beinecke Library, Yale University 41 complete paper The Melk copy, a gift from Mrs. Edward S. Harkness in 1926. Scheide Library, Princeton University 43 incomplete paper The Brinley-Cole-Ives-Ellsworth-Scheide copy, one of three existing copies in its original binding. Lilly Library, Indiana University 46 incomplete paper New Testament only, 12 leaves missing. Part of the same copy as the volume in Mons (see above). Harry Ransom Humanities Research Center, University of Texas at Austin 39 complete paper Purchased in 1978 for 2.4 million US dollars. 34 incomplete paper Vol. I. Today, few copies remain in religious institutions, with most now owned by university libraries and other major scholarly institutions. After centuries in which all copies seem to have remained in Europe, the first Gutenberg Bible reached North America in 1847. It is now in the New York Public Library. In the last hundred years, several long-lost copies have come to light, considerably improving the understanding of how the Bible was produced and distributed. In 1921 a New York rare book dealer, Gabriel Wells, bought a damaged paper copy, dismantled the book and sold sections and individual leaves to book collectors and libraries. The leaves were sold in a portfolio case with an essay written by A. Edward Newton, and were referred to as "Noble Fragments". In 1953 Charles Scribner's Sons, also book dealers in New York, dismembered a paper copy of volume II. The largest portion of this, the New Testament, is now owned by Indiana University. The matching first volume of this copy was subsequently discovered in Mons, Belgium. The only copy held outside Europe or North America is the first volume of a Gutenberg Bible (Hubay 45) at Keio University in Tokyo. The Humanities Media Interface Project (HUMI) at Keio University is known for its high-quality digital images of Gutenberg Bibles and other rare books. Under the direction of Professor Toshiyuki Takamiya, the HUMI team has made digital reproductions of 11 sets of the bible in nine institutions, including both full-text facsimiles held in the collection of the British Library. The last sale of a complete Gutenberg Bible took place in 1978, which sold for $2.2 million. This copy is now in Stuttgart. The price of a complete copy today is estimated at $25−35 million. Individual leaves now sell for $50,000–$150,000, depending upon condition and the desirability of the page. Eight leaves (Book of Esther) from the fragment owned by the Collection of the Library of the Jewish Theological Seminary in New York were sold in June 2015 by Sotheby's for $970,000. A two-volume paper edition of the Gutenberg Bible was stolen from Moscow State University in 2009 and subsequently recovered in a FSB sting operation in 2013. This particular copy had been looted by the Soviet Army after World War II from the Library of the University of Leipzig, Germany, and was estimated to be worth in excess of $20.4 million. Wikimedia Commons has media related to Gutenberg Bible. Niels Henry Sonne. America's Oldest Episcopal Seminary Library and the Needs It Serves. New York? : General Theological Seminary, 1953. St. Mark's Library (General Theological Seminary). The Gutenberg Bible of the General Theological Seminary. New York: St. Mark's Library, the General Theological Seminary, 1963. ^ a b c d e Davies, Martin (1996). The Gutenberg Bible. British Library. ISBN 0-7123-0492-4. ^ "The text of the Bible". bl.uk. British Library. Retrieved 6 November 2016. ^ a b Man, John (2002). Gutenberg: How One Man Remade the World with Words. New York: John Wiley and Sons, Inc. ISBN 0-471-21823-5. ^ "The Gutenberg Bible". utexas.edu. ^ Wagner, Bettina; Reed, Marcia (2010-12-23). Early Printed Books as Material Objects: Proceedings of the Conference Organized by the IFLA Rare Books and Manuscripts Section Munich, 19-21 August 2009. p. 11. ISBN 978-3-11-025530-0. ^ a b c d White, Eric Marshall (2002). "Long Lost Leaves from Gutenberg's Mons-Trier II Bible". Gutenberg Jahrbuch. 77: 19–36. ^ Lane Ford, Margaret (2010). "Deconstruction and Reconstruction: Detecting and Interpreting Sophisticated Copies". In Wagner, Bettina; Reed, Marcia (eds.). Early Printed Books as Material Objects: Proceedings of the Conference Organized by the Ifla Rare Books and Manuscripts Section Munich, 19-21 August 2009. De Gruyter Sur. pp. 291–304. ISBN 978-3-11-025324-5. ^ Paul Needham, 'Format and Paper Size in Fifteenth-century Printing', In: Materielle Aspekte in der Inkunabelforschung, Wiesbaden, 2017, p. 59-108: p. 83. ^ George Gordon and William Noel, 'The Needham Calculator', 2017: http://www.needhamcalculator.net/needham_calculator1.pdf. Accessed 26 August 2018. ^ Man, John (2002). Gutenberg: How One Man Remade the World with Words, New York: John Wiley and Sons, Inc. ISBN 0-471-21823-5. ^ Accessed 26 August 2018. ^ Paul Needham, 'Format and Paper Size in Fifteenth-century Printing', In: Materielle Aspekte in der Inkunabelforschung, Wiesbaden, 2017, p. 83. ^ Neil Harris, 'The Shape of Paper', subsection 'Sheet-size and the Bologna Stone', in: Paper and Watermarks as Bibliographical Evidence, Lyon, Institut d'histoire du livre, 2017, http://ihl.enssib.fr/en/paper-and-watermarks-as-bibliographical-evidence. ^ "Fast Facts: The Gutenberg Bible". utexas.edu. ^ British Library, Making the Bible: the ink accessed 18 October 2009. ^ "InDesign, the hz-program and Gutenberg's secret". ^ a b Kapr, Albert (1996). Johann Gutenberg: The Man and His Invention. Scolar Press. ISBN 1-85928-114-1. ^ "Gutenberg Bible: The Copy on Paper – the Decoration". bl.uk. ^ a b Estes, Richard (2005). The 550th Anniversary Pictorial Census of the Gutenberg Bible. Gutenberg Research Center. p. 151. ^ a b Jensen, Kristian (2003). "Printing the Bible in the fifteenth century: devotion, philology and commerce". In Jensen, Kristian (ed.). Incunabula and their readers: printing, selling and using books in the fifteenth century. British Library. pp. 115–38. ISBN 0-7123-4769-0. ^ Shestack, Alan (1967). Fifteenth Century Engravings of Northern Europe. National Gallery of Art, Washington, DC. LCCN 67029080. ^ van Buren, Anne H.; Edmunds, Sheila (March 1974). "Playing Cards and Manuscripts: Some Widely Disseminated Fifteenth Century Model Sheets". The Art Bulletin. 56 (1): 12–30. doi:10.1080/00043079.1974.10789835. ISSN 0004-3079. JSTOR 3049193. ^ a b c d White, Eric Marshall (2010). "The Gutenberg Bibles that Survive as Binder's Waste". In Wagner, Bettina; Reed, Marcia (eds.). Early Printed Books as Material Objects: Proceedings of the Conference Organized by the Ifla Rare Books and Manuscripts Section Munich, 19-21 August 2009. De Gruyter Sur. pp. 21–35. ISBN 978-3-11-025324-5. ^ McGrath, Alister (2001). In the Beginning: The Story of the King James Bible and How It Changed a Nation, a Language, and a Culture. Anchor Books. p. 15. ISBN 0-385-72216-8. ^ Cormack, Lesley B.; Ede, Andrew (2004). A History of Science in Society: From Philosophy to Utility. Broadview Press. p. 95. ISBN 1-55111-332-5. ^ Needham, Paul (1999). "The Changing Shape of the Vulgate Bible in Fifteenth-Century Printing Shops". In Saenger, Paul; Van Kampen, Kimberly (eds.). The Bible as Book:the First Printed Editions. British Library. pp. 53–70. ISBN 0-7123-4601-5. ^ Needham, Paul (2010). "Copy Specifics in the Printing Shop". In Wagner, Bettina; Reed, Marcia (eds.). Early Printed Books as Material Objects: Proceedings of the Conference Organized by the Ifla Rare Books and Manuscripts Section Munich, 19-21 August 2009. De Gruyter Sur. pp. 9–20. ISBN 978-3-11-025324-5. ^ a b St. Mark's Library (General Theological Seminary). The Gutenberg Bible of the General Theological Seminary. New York: St. Mark's Library, the General Theological Seminary, 1963. ^ Estelle Betzold Doheny (1987). The Estelle Doheny Collection: Fifteenth-century books, including the Gutenberg Bible. 1. Christie, Manson & Woods International. pp. 23–. ^ "ISTC (Incunabula Shorttitle Catalogue)". AMPLE. Consortium of European Research Libraries. June 5, 2018. Archived from the original on June 5, 2018. Retrieved June 5, 2018. ^ Das Antiquariat ... (in German). 7. W. Krieg. 1951. pp. 122–. Das Exemplar enthält das älteste festgestellte Da*tum, das im Zusammenhang mit der Gutenberg*Bibel steht. ... Mit der „tabula rubricarum", auf 4 Blättern am Schluß des Werkes gedruckt. ... Das Exemplar gehörte früher Friedrich Karl Joseph von Erthal, dem Kurfürsten von Mainz, dessen Bibliothek 1793 aufgeteilt wurde. ^ a b Bettina Wagner; Marcia Reed (23 December 2010). Early Printed Books as Material Objects: Proceedings of the Conference Organized by the IFLA Rare Books and Manuscripts Section Munich, 19-21 August 2009. Walter de Gruyter. pp. 15–. ISBN 978-3-11-025530-0. As has been known for decades, the Gutenberg Bible shop printed not just the Bible itself, but also a separate rubric guide ... Gutenberg Bible at the Bayerische Staatsbibliothek, Munich, and at the Österreichische Nationalbibliothek, Vienna. ^ Antiquarian Bookman. 14-26. 18. R.R. Bowker. 1956. pp. 1410–. The example of the Gutenberg Bible in Mons is quite incomplete, containing only 220 leaves of Volume I. Folio 1 is ... end of the Book of Ruth (folio 128 verso) and chapter 5 of Kings II (folio 149 recto) These comprise the 104 missing leaves. ^ Harald Ilsøe (1999). Det kongelige Bibliotek i støbeskeen: studier og samlinger til bestandens historie indtil ca. 1780 (in Danish). Museum Tusculanum Press. pp. 65–. ISBN 978-87-7289-550-5. Med et eksemplar af bind 2 af Gutenberg-biblen trykt i Mainz ca. ... af bøger til forsendelse trak ud, blev biblioteket først endeligt modtaget i København 1749. ^ AB Bookman's Yearbook. Bookman's weekly. 1956. pp. 391–. It is hoped these emendations will bring this revision of the Gutenberg Bible list totally up to date. The compiler ... In 1788 or shortly afterwards, it was rebound in red morocco, with the arms of Louis XVI stamped in gilt on the covers, in 4 vols. ^ Das Antiquariat ... (in German). 7. W. Krieg. 1951. pp. 122–. Am Schlüsse der beiden Bände sind Vermerke des Rubrikators und Buchbinders Henricus Cremer über die Voll*endung seiner Arbeit eingetragen: (Bd. I ... 24. August 1456; Bd. II . . . 15. August 1456). ^ Howard, Nicole (2005-09-30). The Book: The Life Story Of A Technology. Greenwood Publishing Group. p. 31. ISBN 978-0-313-33028-5. Retrieved 23 August 2012. ^ Frederick Richmond Goff (27 July 1971). The permanence of Johann Gutenberg. Humanities Research Center, University of Texas at Austin; [distributed by University of Texas Press. pp. 18–. ^ Sandra Kirshenbaum. Fine Print. S. Kirshenbaum. pp. 102–. Early in March Mr. Kraus sold his Bible, known as the Shuckburgh copy, to the Gutenberg Museum of Mainz for $1,800,000, the highest price ever paid ..
^ Gutenberg-Gesellschaft (1979). Aloys Ruppel, 1882–1977: Würdigung bei der Gedächtnisfeier des Fachbereichs 16 Geschichtswissenschaft der Johannes Gutenberg-Universität Mainz und der Gutenberg-Gesellschaft am 21. Juni 1978 (in German). Verlag der Gutenberg-Gesellschaft. pp. 26–. Als wir 1925 das silberne Jubiläum des Gutenberg-Museums vorbereiteten, rief mich Ministerialrat Hassinger vom ... von Solms-Laubach wolle sein Exemplar verkaufen und habe bereits ein Angebot von einem Leipziger Antiquar erhalten. ^ "Vor ungefähr 600 Jahren wurde Gutenberg geboren. Mainz ehrt ihn auf verschiedene Weisen: Heute für Stielaugen". Berliner Zeitung. Retrieved 5 March 2016. ^ White, Eric Marshall; Rosenstein, Natalee; Travis, Trysh; Adams, Peter W.; Baensch, Robert E. (2003). "Book reviews". Publishing Research Quarterly. 19 (2): 65–72. doi:10.1007/s12109-003-0009-3. ISSN 1053-8801. ^ "Ellensburg Daily Record – Google News Archive Search". google.com. ^ a b "Gutenberg Bible: The HUMI Project". The Morgan Library and Museum. The Morgan Library and Museum. Retrieved 13 May 2016. ^ Muzeum Diecezjalne (2017). "Biblia Gutenberga" [The Gutenberg Bible]. Pelplin. Google translate. ^ "German Museum of Books and Writing "Signs – Books – Networks"". Retrieved 10 April 2016. ^ Georg Jäger (30 July 2010). Geschichte des deutschen Buchhandels im 19. und 20. Jahrhundert. Band 1: Das Kaiserreich 1871–1918 (in German). Walter de Gruyter. pp. 218–. ISBN 978-3-11-023238-7. ^ "Buch- und Schriftkultur: Das Geisterhaus – Kultur – Tagesspiegel" (in German). Retrieved 10 April 2016. ^ Johann Wetter (1836). Kritische Geschichte der Erfindung der Buchdruckerkunst durch Johann Gutenberg zu Mainz, begleitet mit einer, vorhin noch nie angestellten, genauen Prüfung und gänzlichen Beseitigung der von Schöpfiin und seinen Anhängern verfochtenen Ansprüche der Stadt Strassburg, und einer neuen Untersuchung der Ansprüche der Stadt Harlem und vollständigen Widerlegung ihrei Verfechter Junius, Meerman, Koning, Dibdin, Otley und Ebert (in German). J. Wirth. pp. 520–. ^ Henry Noel Humphreys (1867). A History of the Art of Printing: From Its Invention to Its Wide-spread Development in the Middle of the 16th Century : Preceded by a Short Account of the Origin of the Alphabet and the Successive Methods of Recording Events and Multiplying Ms. Books Before the Invention of Printing. B. Quaritch. pp. 62–. ^ Donald Kerr (1 January 2006). Amassing Treasures for All Times: Sir George Grey, Colonial Bookman and Collector. Oak Knoll Press. pp. 95–. ISBN 978-1-58456-196-5. ^ Thomas Frognall Dibdin (1814). Bibliotheca Spenceriana; Or a Descriptive Catalogue of the Books Printed in the Fifteenth Century, and of Many Valuable First Editions in the Library of George John Earl Spencer. 1. pp. 6–. ^ Albert Charles Robinson Carter (1940). Let Me Tell You. Hutchinson & Company. pp. 202–. ^ "Bod-Inc online". Retrieved 5 March 2016. ^ "Cambridge University Library – Addendum". Addendum. Retrieved 5 March 2016. ^ Peter Fox (27 August 1998). Cambridge University Library: The Great Collections. Cambridge University Press. pp. 65–. ISBN 978-0-521-62647-7. ^ Takami Matsuda; Richard A. Linenthal; John Scahill (1 January 2004). The medieval book and a modern collector: essays in honour of Toshiyuki Takamiya. D.S. Brewer. pp. 448–. ISBN 978-4-8419-0348-5. ^ Christopher Morley; Ken Kalfus; Walter Jack Duncan (January 1990). Christopher Morley's Philadelphia. Fordham Univ Press. pp. 76–. ISBN 978-0-8232-1270-5. ^ Randolph G. Adams (1939). The Americanists. pp. 49–. This particular Bible came from Erfurt, in Germany.24 It was handled by a Berlin dealer, A. Asher, who also had a ... So Brinley got a Gutenberg Bible at ,£637-15-0, and, as Stevens said, "Cheap at the price." 25 But ... Brinley — Hamilton Cole — Brayton Ives — James W. Ellsworth — A. S. W. Rosenbach — John H. Scheide. ^ Grolier Club (1966). Gazette of the Grolier Club. pp. 116–. There were three main type groups represented in the exhibition: The type of the 42-line Bible. The type of the 36-line ... 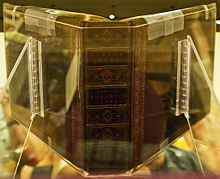 THE 4'2-LINE BIBLE This work is the masterpiece of Johann Gutenberg. Mr. Goff has ... now owned by Arthur A. Houghton Jr.; and the Brinley-Cole-Ives-Ellsworth copy, now owned by William H. Scheide. ^ Princeton Alumni Weekly. 61. princeton alumni weekly. 1960. pp. 86–. PRNC:32101081976894. ^ Frank P. Leslie (1960). The 46th Gutenberg. Vagabond Press. ^ The Friends of the Lilly Library Newsletter. 29-32. Indiana University Foundation. 1998. pp. 5–. The second volume of the Gutenberg Bible from which the Lilly Library New Testament would eventually be extracted was discovered in 1828 in a farmhouse ... The copy had 116 leaves of the original 128 of a full Gutenberg New Testament. ^ Lotte Hellinga; Martin Davies (1999). Incunabula: studies in fifteenth-century printed books presented to Lotte Hellinga. British Library. pp. 341–. ^ "Incunabula Leaf Biblia Latina (ca 1450) Gutenberg". The McCune Collection. 31 August 2014. Retrieved 1 October 2014. ^ Pearson, David (2006). Bowman, J (ed.). British Librarianship and Information Work 1991–2000: Rare book librarianship and historical bibliography. Aldershot: Ashgate Publishing Ltd. p. 178. ISBN 978-0-7546-4779-9. ^ "Russia sentences secret agents over theft of Gutenberg Bible". BBC News. 1462 The Gutenberg Bible Latin Vulgate. archive.org.